Nice and soft, the flannel fabric keeps you very warm. Washes and dries nicely. Superior warmly brings you cotton flannel duvet cover sets in an attractive ever-popular trellis design. 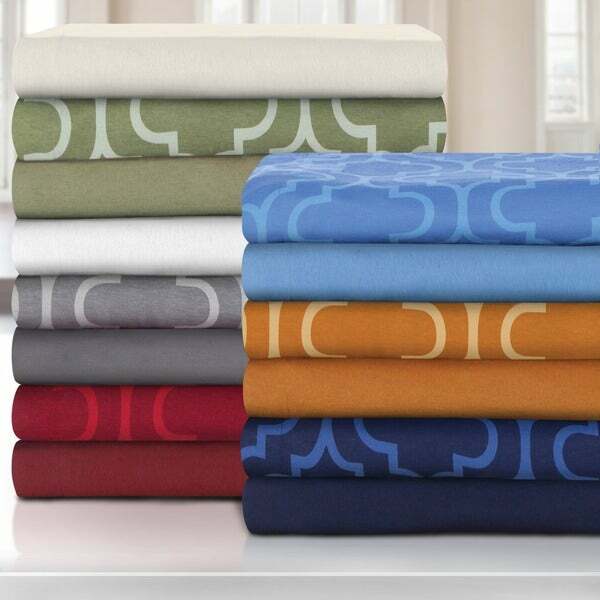 Soft and warm all-season flannel cotton construction ensures cozy comfort, yet light enough to use all year long. Flannel fabric is both breathable and wrinkle resistant as well. The cotton flannel is brushed on both sides to give you soft comfort. Available in a variety of sizes and warm colors also can pair with matching sheet and pillowcase sets for an impressive coordinating look. Dimensions 10.5 in. X 13 in. X 5 in. I love the brushed cotton flannel aspect of my duvet cover. It's soft, warm and can be a cover for all seasons. It's easy to launder and always looks nice. Our guest bedroom desperately needed new bedding. I have purchased sheets and duvet sets from Overstock for many years. The prices and choices are consistently great. This set is beautiful, soft and well made. The flannel laundered well - not too much fuzz. I like the pattern. I bought the green set and paired it with the "Solid or Print Cotton Heavyweight Flannel Deep Pocket Sheet Set" ITEM#: 13980604 - white. It's stylish and looks good in the room. The guests (of which there were many during the holidays) all said that the sheets, pillowcases and duvet cover were soft and comfy. Thank you Overstock for providing quality bedding at more than fair prices. I am a fan! Overstock shipped quickly. Beautiful soft brushed cotton adds extra warmth in my basement guest room. I haven't washed it yet but it is well made and I don't anticipate any problem. Highly recommend. Received the cover on time. The color is nice and the quality feels good but the material is far too scratchy to be a 'superior' flannel. I washed it and used fabric softener but this duvet cover is anything but soft. Even my husband, who usually doesn't notice a change of bedding, commented that it was not soft. If I had felt it at a store I would not have purchased. I love this duvet cover as it keeps me so nice. The flannel is soft and fabric is thick. I washed it and dried well with minimal shrinkage. I happy with my purchase. Duvet is a beautiful color (i ordered the orange). Its warm and I like the fact that it is reversible! I love this duvet cover! It’s very soft and the perfect color match for my room. Ordering was easy and it shipped right away. No problems at all! While I love the softness of this duvet, so do my pets. I can't get them off the bed. I thought a Duvet would take care of the problem of a polyester comfortor that I have, it did not. I really have to make sure not to buy polyester, I sweat under this material. Now instead of this duvet which is great, it's cotton, I wish I bought a new comforter! Very happy with product. Perfect color for my room. I like the way they look. They absolutely do not pill but are also not very soft. It looks nice and cosy, but it had a stain so I returned it. I bought the white/cream one and it is a pleasant color. Overstock is awesome at handling returns. Pretty average quality and weight, but good price. I ordered the pure white, and I think it’s more ivory than white. Also, the blank tends to bunch up in inside; the duvet seems a little too big. Overall, it’s just okay, but not bad for the price. Washes beautifully. Comfortable from the beginning. Would buy again. "Does this duvet have corner securing ties?" "Is the back, of the twin set in the color: trellis pumpkin, solid? If it is solid, which is the color? The back is also flannel? It is reversible?" I have the solid green color, but I imagine the back side of the trellis design will be the pumpkin color. The back is flannel. You can have the solid side up or the trellis design side up. Ask Overstock to confirm that the back is the solid pumpkin. This set features inverted trellis coloration on the reverse side. The solid options features solid on the reverse side as well. Each duvet is reversible and features flannel on both sides. I wanted a burgundy or dark red colored duvet for male room and this was the closest that I could find to a pattern that was not feminine. My son likes flannel and it has good reviews. "What would be on the reverse side if I chose solid white for one side?" It is the same color on both sides.